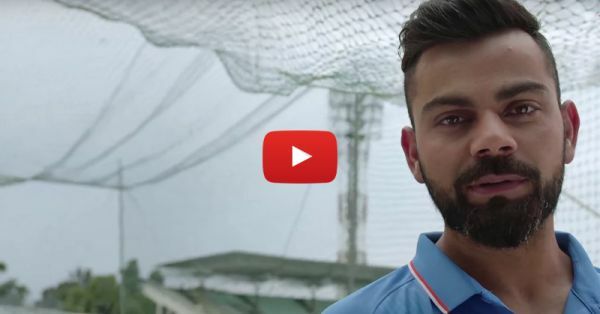 What Virat Kohli Says In This Video Will Melt Your Heart! We know nobody's perfect, but when it comes to Virat Kohli we can say that he is. He is that one guy who’s loved by everyone, whether they are cricket fans or not. He has proved that he’s a gentleman, and of course, he’s amazingly good looking - most girls would kill to be with a guy like him. Most of us are known by our father’s name because we carry his last name, but what about our mothers? Our mothers make us who we are, they are really very special... Virat wore a jersey with his mother’s name written on it and the reason behind it will just melt your heart like butter on hot paranthas (seriously)! We just want to send out flying kisses to Virat for being the amazing person that he is! Dear Virat, you’ve stolen our hearts once again… Watch this video by STAR Plus to get your heart stolen by this charming man (yet again)... Also watch: Virat Kohli’s Dance Moves Will Make You Go CRAZY!